These Easy Cinnamon Raisin Biscuits are tender, flaky and studded with sweet, plump raisins. Ridiculously easy, ridiculously delicious! 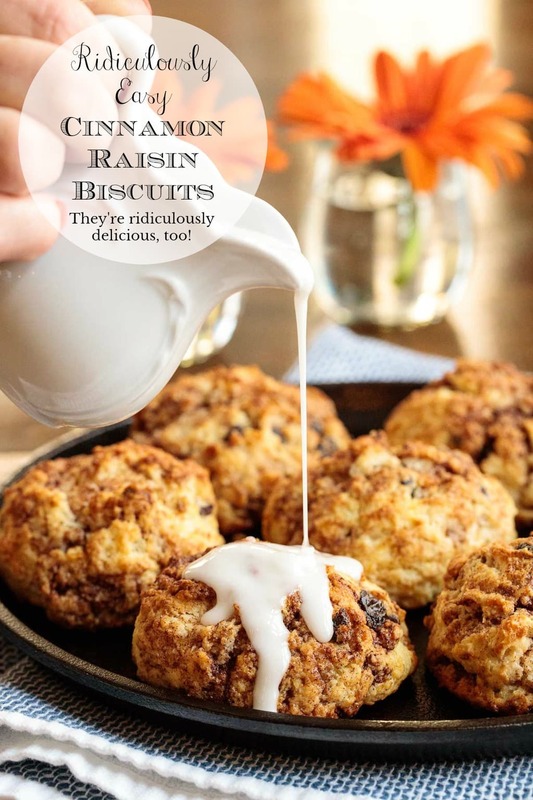 I started to call these delicious biscuits, Ridiculously Ridiculously Easy Cinnamon Raisin Biscuits – but then I thought …um… that might sound… sort of ridiculous. So, just between you and me (because we’re friends), they really are ridiculously, ridiculously easy. But I won’t call them that. For the sake of not sounding ridiculous. Why would I say something so redundant? 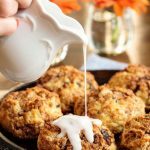 It’s just because these biscuits are so… easy, you might not even believe it – unless I started talking a little crazy like “ridiculously, ridiculously easy”. If you’re new to The Café you might not know about our Ridiculously Easy recipes. You can read more about them in this post but, in a nutshell, Ridiculously Easy recipes are super simple, yet worthy of the highest accolades. My biscuits use an unconventional technique to make them flaky and tender. The classic technique for biscuits is to combine cold butter and flour together in a way that maintains little pieces of butter. Similar to the method used with pie crusts, doughs and scones, its these little pieces of fat (with pie crust, it’s sometimes butter, sometimes another type of shortening) that make the finished product flaky and tender. There are different ways to achieve this effect. Some people use a pastry or dough cutter. Others use their fingers to rub the butter into the flour until it looks like “coarse oatmeal”. I’ve even heard of pie, biscuit and scone makers that freeze the butter (or other shortenings) and grate it, before adding to the flour. All of these techniques work well and they’re not terribly difficult – just a bit too much when life is busy. The method employed with all of our biscuits (and also the Café scone recipes) is almost too good to be true: chill buttermilk (or cream, in the case of scones), melt butter and stir them together with a fork. VOILA! You have the highly coveted little chunks of butter, all set to be stirred into the flour – with almost NO work. You see what I mean? Ridiculously easy! 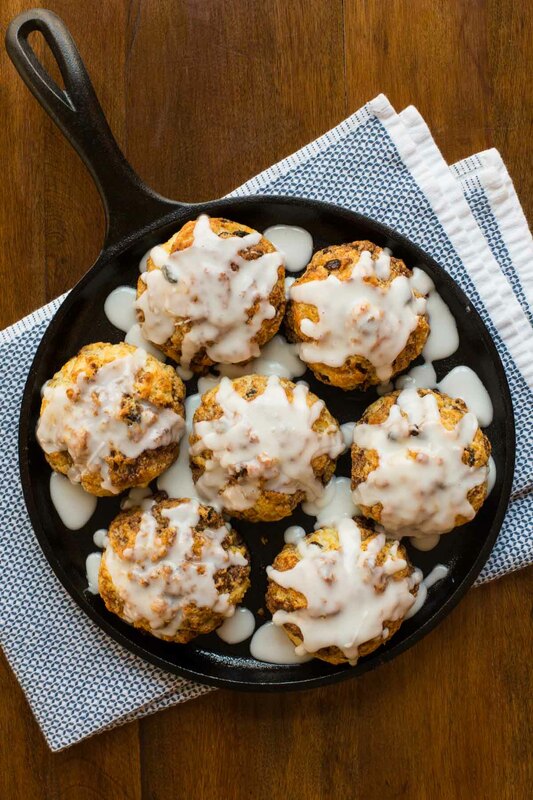 And these easy cinnamon raisin biscuits take the whole easy thing, one step further. Instead of having to roll out the dough and cut out the biscuits, you simply scoop up the dough and place the little mounds on a sheet pan. Bake and wait for the most tantalizing aroma to fill the house. When the biscuits emerge from the oven they have lots of crinkly-craggly crevices to hold the sweet vanilla icing – you’ll have a hard time waiting for them to cool! I’ve always been a sucker for the cinnamon raisin biscuits at Hardee’s. I use a super simple icing on my biscuits similar to the type they use. It’s comprised of powdered sugar and milk with a few drops of vanilla. 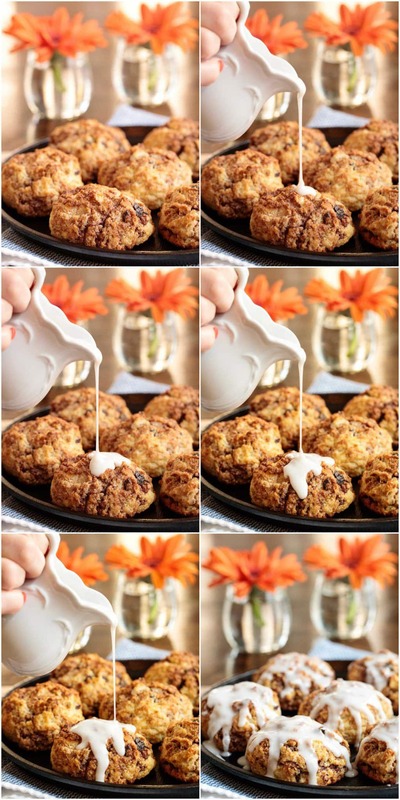 A perfect compliment for the raisin-studded, cinnamon-laced biscuits! Do you have company coming? Or maybe you just want to treat family or friends to something special. Whip up a batch of these wonderful (and ridiculously easy) cinnamon raisin biscuits. It will take you less than 15 minutes (plus baking time)! Oh, and a little secret? A batch of these biscuits, baking in the oven is a sneaky (but delicious) way to get even the sleepiest heads out of bed in the morning as the amazing aroma wafts through the house. Don’t worry if your raisins look dry and/or shriveled. The simple plumping technique will transform them and they’ll taste nice and fresh. If you don’t have buttermilk, make your own. 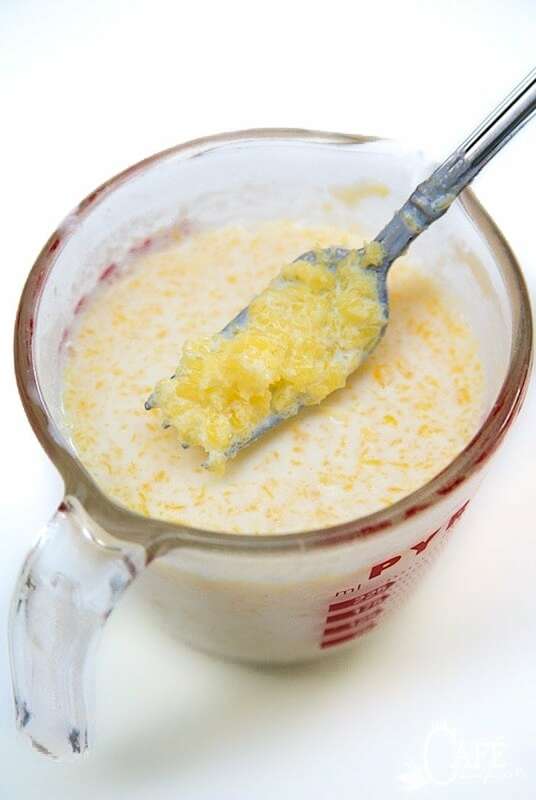 Place 1 tablespoon of fresh lemon juice or vinegar in a measuring cup. Fill to 1 cup level with milk and stir well. Allow the mixture to sit for 5-10 minutes or until slightly thickened. The mixture may curdle a bit, that’s okay! Use in recipes in lieu of buttermilk. Don’t skip chilling the buttermilk! It makes this recipe work! If the buttermilk is not really cold, the little butter globules won’t form. When mixing in the cinnamon/sugar, you want the dough to have ribbons of the cinnamon mixture. You don’t want it completely incorporated into the dough so don’t over-mix. That being said, you don’t want a lot of loose cinnamon/sugar in the dough which can burn on the bottom of the biscuits. So don’t under-mix either. Folding the dough over 3-4 times, should be perfect! Our daughter lived in London for 7 years. During my visits there I learned the UK all-purpose flour (plain flour) is a bit different and it seemed I needed more, probably closer to 2¼ cups. These biscuits freeze well, either baked or unbaked. Just place biscuits on a sheet pan or a plate spaced at least a half inch from each other. Freeze till frozen, then transfer biscuits to a ziplock bag or air-tight storage container. If the biscuits have been baked, allow them to thaw and then warm in the oven before serving. If frozen unbaked, you can go right from the freezer to the oven. Allow a few extra minutes in baking time. I use a large trigger ice cream scooper to scoop up my biscuits into nice consistent-sized mounds. A little trick is to spray the scooper with non-stick cooking spray for easy scooping. 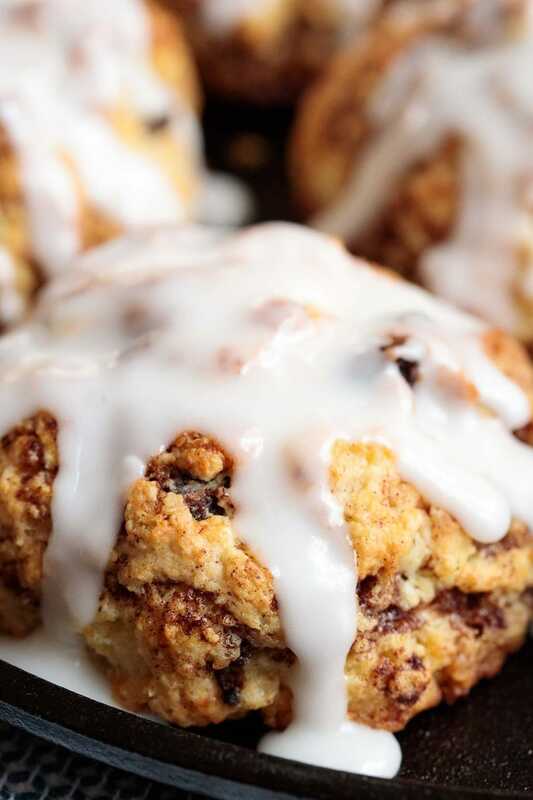 For a pretty presentation, I love to bake and serve these cinnamon raisin biscuits on a cast iron griddle pan. 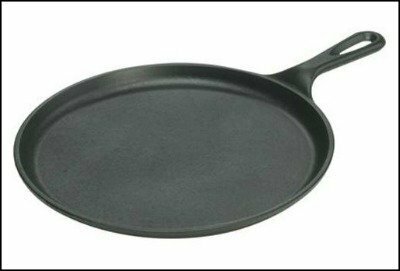 This pan is also wonderful for grilled sandwiches, pancakes and pizza. It would make a fun gift for a cooking friend or family member! Line a sheet pan with parchment paper or spray a sheet pan with cooking spray. Combine the raisins and water in a microwave-safe bowl or cup. Cover with a small plate or plastic wrap. Microwave on high for 30 seconds. Remove from microwave, uncover and stir with a fork to loosen and separate. Set aside to cool. Measure 1 cup of buttermilk and place in the freezer while prepping other ingredients (you want it to be in the freezer about 10 minutes). Place butter in a microwave-safe bowl, cover with a paper towel and heat on high for 40 seconds. If not completely melted, return to microwave for 10-second intervals till melted. Set aside to cool. For the cinnamon swirl, stir together cinnamon and sugar. Add the 1 tablespoon melted butter and water. Stir until combined. The mixture will be the consistency of wet sand. Set aside. Whisk flour, baking powder, baking soda, sugar and salt in a large bowl. Add raisins and stir to coat. Add buttermilk mixture to dry ingredients and stir with rubber spatula just until all flour is incorporated. Dough will be fairly stiff. Scatter cinnamon sugar mixture over the top and, with a rubber spatula fold the dough from the bottom of the bowl over the cinnamon/sugar mixture on the top. Repeat. Don’t stir the dough, just fold it 3-4 times until it's incorporated in the dough in ribbons. You want the cinnamon/sugar mixture mixed into the dough, but it should be in raggedy ribbons throughout the dough. Adjust oven rack to the center of the oven and heat oven to 400°F. Bake until tops are light golden brown and crisp, 14 to 18 minutes. Remove from oven and allow to cool, then drizzle with icing. Combine powdered sugar, 2 tablespoons of milk and vanilla and whisk together until smooth. The mixture should be thick, but pourable. If too thick, add a little more milk. Drizzle over biscuits in desired amount. For more details tips and instructions see Café Tips above in post. Mine totally spread out too. Followed directions exactly so can’t figure out what went wrong. Hmmm, I’m not sure why this happened. I’m going to re-visit the recipe and see if I can figure it out. I cannot wait to try these Chris! I love anything with cinnamon and raisins! Such a great little breakfast treat! I’m all about ridiculously easy and these look so delicious! Wonderful to enjoy any time of day, too 🙂 Hope you had a wonderful Thanksgiving! I’m confused. Melted butter is mentioned in both step 5 and step 7. Hi Laura, there is melted butter in both the biscuit dough and also a tablespoon in the cinnamon swirl. I’ve tried to make that a little more clear in the recipe. Thanks for pointing that out. I love your recipes and have made SO many of them witn high compliments. I just made these today and followed the directions exactly. Half of them spread out almost like a cookie…any idea what I did wrong. Hmm… I’m not sure exactly what could have gone wrong, Kathryn. These biscuits will spread out a bit (more than rolled biscuits) but shouldn’t look like cookies. The only thing I can think of is that the dough got too warm before baking and the little butter globules softened too much. What a delicious treat these would be – and I don’t want to wait for company to try them! Great recipe Chris – pinning! Cinnamon bun and biscuit are two of my favourites! This is perfect for the holidays or any day! Could you use fresh apple cubes in place of raisins and could you add nuts? Yes, apples and nuts would be wonderful. But since they only bake for about 18 minutes (or less), I would not use a super firm apple. Maybe something like a golden delicious. I made a cobbler topping using this same biscuit technique! They were so tender and flaky. I know your biscuits will turn out perfectly! These do look ridiculously easy but you make everything look so easy. Wondering if it would be possible to sub the raisins with something else such as blueberries or dried apricots maybe? Raisins aren’t as popular in our house but I love the concept of these biscuits. Any dried fruit would be wonderful in these Xena! I think apricot sounds delicious as does dried blueberries!